Surprise, surprise. Microsoft released a new web browser yesterday that is not Internet Explorer or Microsoft Edge. 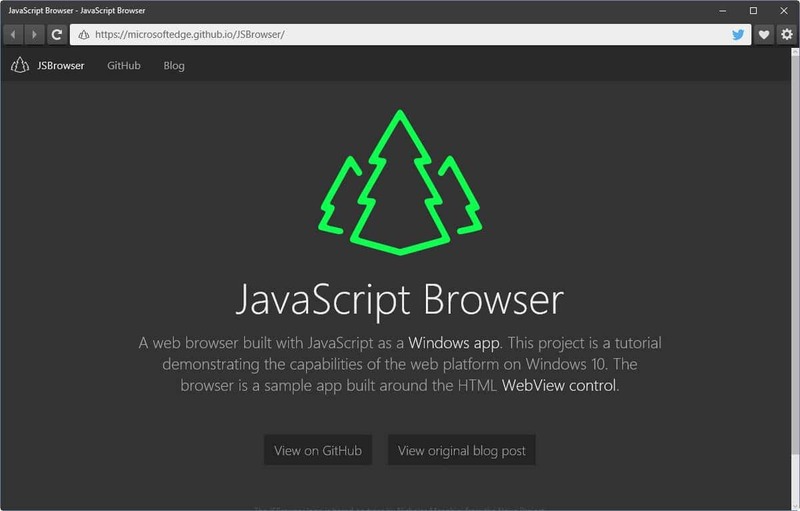 The browser has been released as a proof-of-concept to demonstrate the capabilities of the Windows 10 platform. The browser works like any other app on Windows 10: you can open it from the start menu for instance. When you do, the following screen is displayed by default. Keep in mind that this is more of a tech demonstration than a browser that you may want to switch to right now. The interface looks similar to modern browsers. What you may notice immediately is that it does not support tabs. This means that you can only display a single web page or service in it at all time. When you play around with the browser for a bit, you will notice that other components are missing. For instance, while settings are available, they are limited to going full screen and clearing the cache and favorites. Other missing features include extensions, web permissions, Developer tools or on-page search. The browser uses EdgeHTML, the Microsoft Edge rendering engine, via the WebView control that Windows 10 apps can utilize. Microsoft published a blog post that offers additional details about the development process. Source code bits and development information have been posted to Github where interested users can access them. The browser does not support plugins which means that you won't be able to load Flash or Java apps or games on websites. While it worked fine mostly for basic tasks such as watching a video or reading an article, it lacks customization and control options that other browsers offer. it’s the first time i get excite about a browser in ages. Coupled with Oracle(TM) Technology – a Database Corp. originally – this “browser” is another Terminal for Microsoft for you to use. Why Terminal? Because with JS the system UUIDs and unique identifications are even stronger than in Chrome. Please note that Oracle, founded by CIA on start, cleverly noted the powers of JS and bought Java from Sun. *forgot the Google DNS, too. *.gfx.ms are servers running jQuery. The calls are automated and the servers respond to JS only. If you go by will at the URL you see some jQuery code that was expecting some telemetry data input. Microsoft didn’t even care to redir to the homepage… Bye. Mozilla’s HTML browser will be a cross platform one, plus all of the technologies used will of course be open source. Microsoft’s are not. They know what open source is, but they don’t see it as being profitable so they’ll continue to use proprietary technologies. I don’t fault them for that at all. They do what they do to make money. I use and support open source products as much as possible, but I also believe in Capitalism. So it’s just a pretty simple GUI to the real browser engine (certainly not written in JS). How is that a JS browser?